Melt butter in a large saucepan over medium heat. Stir occasionally. The butter will foam up, then back down and start forming brown-colored milk solids or “bits”. When it is a nice light brown and it starts to smell like you could drink it straight, that’s when you know it’s done. Add the flour and mix until just incorporated. Batter will be about the consistency of cement. Have a taste. It’s awesome. 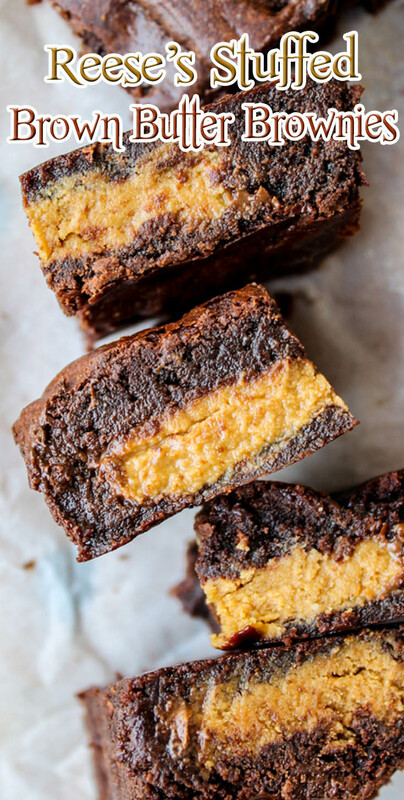 Unwrap 12 (or 11...) large Reeses PB cups and press them into the brownie batter. Swirl the top with a spatula, so that the PB Cups are covered. Bake at 350 for about 25-30 minutes, or until a toothpick comes out batter-free. The center of the pan should be mostly set.